On 19 December 2014 the Company acquired from CDP Gas S.r.l. 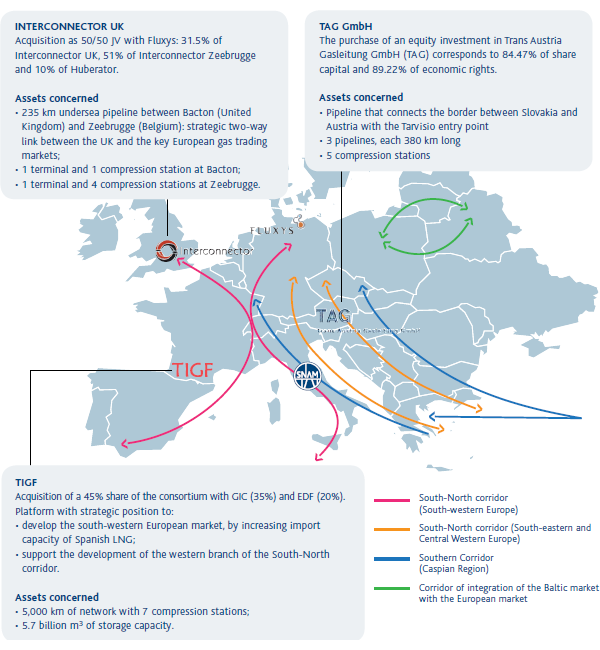 84.47% of Trans Austria Gasleitung GmbH (TAG), the company that owns the Austrian section of the pipeline connecting Russia to Italy. This transaction, which was in keeping with the international development strategy initiated by Snam in 2012 with the acquisitions of 45% of TIGF in France and 31.5% of Interconnector UK in a joint venture with Fluxys in the UK, and the signing of a Memorandum of Understanding (MoU) at the beginning of 2014 with the same Belgian operator in order to pursue growth opportunities in Europe, enhances the Group’s leadership among infrastructure operators in Europe. Snam is now able to take advantage of a new key asset in the East-West energy corridor, including in the context of a potential reverse flow to Central Europe.